Billy Bloom is one-of-a-kind: a fabulous, glitter-bedecked, gender-fluid teenager whose razor-sharp wit is matched only by his outrageous, anything-goes fashion sense. But when he's forced to live with his straight-laced father, Billy finds himself a diva-out-of-water at his new ultra-conservative high school. Undaunted by the bullies who refuse to understand him, the fearless Billy sets out to make a big statement in his own inimitable way: challenging the school's reigning mean girl for the title of homecoming queen! Nominated for several awards at the Berlin and Edinburgh International Film Festivals, this proudly offbeat comedy from – and directorial debut of – Trudie Styler is adapted from the critically acclaimed novel by James St. James. 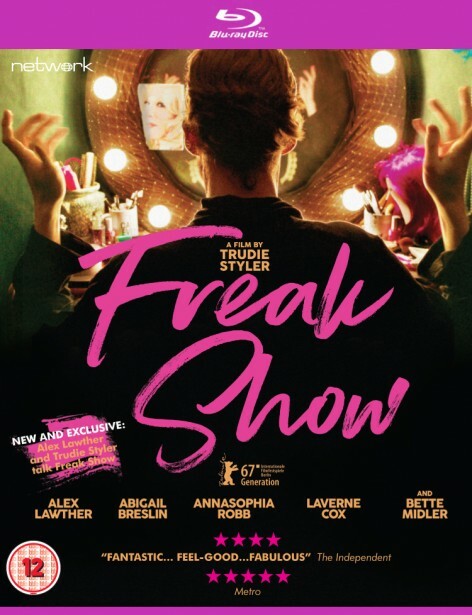 Freak Show stars Alex Lawther, Laverne Cox, Bette Midler, Abigail Breslin, Annasophia Robb and Ian Nelson, and is an irresistible ode to outsiders and non-conformists of all stripes! Special Feature: Filmed in New York on 20 November 2018, Alex Lawther and Trudie Styler talk frankly about their Freak Show experience.